The TC1426/27/28 are a family of 1.2A dual high- speed drivers. CMOS fabrication is used for low power consumption and high efficiency. These devices are fabricated using an epitaxial layer to effectively short out the intrinsic parasitic transistor responsible for CMOS latch-up. They incorporate a number of other design and process refinements to increase their long-term reliability. The TC1426 is compatible with the bipolar DS0026, but only draws 1/5 of the quiescent current. The TC1426/27/28 are also compatible with the TC426/27/28, but with 1.2A peak output current rather than the 1.5A of the TC426/27/28 devices. Other compatible drivers are the TC4426/27/28 and the TC4426A/27A/28A. The TC4426/27/28 have the added feature that the inputs can withstand negative voltage up to 5V with diode protection circuits. The TC4426A/27A/28A have matched input to output leading edge and falling edge delays, tD1 and tD2, for processing short duration pulses in the 25 nanoseconds range. All of the above drivers are pin compatible. 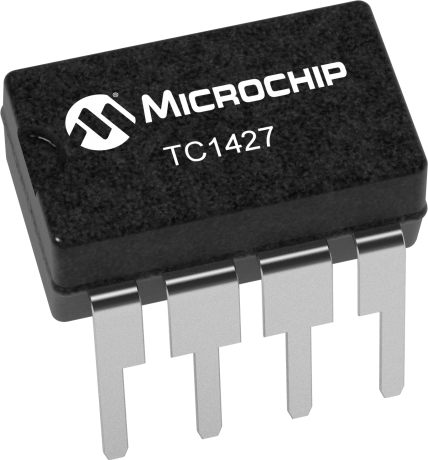 The high-input impedance TC1426/27/28 drivers are CMOS/TTL input-compatible, do not require the speed-up needed by the bipolar devices, and can be directly driven by most PWM ICs. This family of devices is available in inverting and non-inverting versions. Specifications have been optimized to achieve low-cost and high-performance devices,well-suited for the high-volume manufacturer.